Majestic and fascinating, the brown bear (Ursus arctos L.) has always aroused the interest of man, so much so that its history has repeatedly intertwined with that of our species. 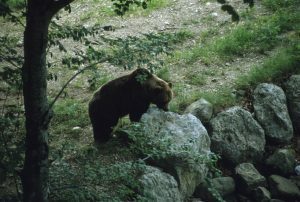 Persecuted by all means for centuries, the bear remained confined to a small area of western Trentino, which became the Adamello Brenta Natural Park to protect the plantigrade. To avoid the imminent extinction of the species, in 1996 the Park launched the Life Ursus reintroduction project. Between 1999 and 2002, 10 brown bear specimens were released, which adapted well to the new living environment and gave rise to a population that today consists of about 50 specimens in the Central Alps. However, the definitive return of the species to the Alps is still far away: despite the environmental suitability of much of the Alpine Arch, the future of the bear is strongly linked to the development of a culture of coexistence between men and bears. For this reason, the commitment of the Park continues thanks to the scientific research activity and to the awareness-raising work that the Brown Bear Research and Conservation Group conducts within the Bear Project. The Park was also a partner of the LIFE ARCTOS project “Conservation of the brown bear: coordinated actions for the Alpine and Apennine range”, an initiative aimed at promoting the protection of the brown bear populations of the Alps and the Apennines and to support the numerical expansion completed in 2014. Download the document “COMUNICARE L’ORSO – Attività intraprese e lezioni apprese nell’ambito del Progetto LIFE ARCTOS: .pdf, 2Mb). – Documenti del Parco n.18 – L’impegno del Parco per l’orso: il Progetto Life Ursus (.pdf 10.6Mb). – Documenti del Parco n.20 – Dal rapporto con l’uomo alle strategie di svernamento: le ultime ricerche del Parco Naturale Adamello Brenta per l’orso (.pdf 21Mb). – Influence of human disturbance towards brown bear. Expert opinion based survey (.pdf 3.8Mb).